Last summer we featured Senior Service Technician Rob Page’s Norco Search, which he had kitted out for high-speed summer commuting. Since then Rob has taken what he learned from that build, and customized himself a second Search, this time with an emphasis on stability and balance to make it the ideal winter commuter bike! Rob is an avid bike commuter, cycling over 30km to work nearly every day, no matter the weather. With more and more cycling-friendly routes being opened in BC’s lower mainland, there are more options than ever for a safe and enjoyable ride in to work. Rob’s usual route sees him navigating a mix of gravel and asphalt, and occasionally a bit of mud for good measure. (Fording flooded roads happens infrequently, despite the torrential rains this time of year.) 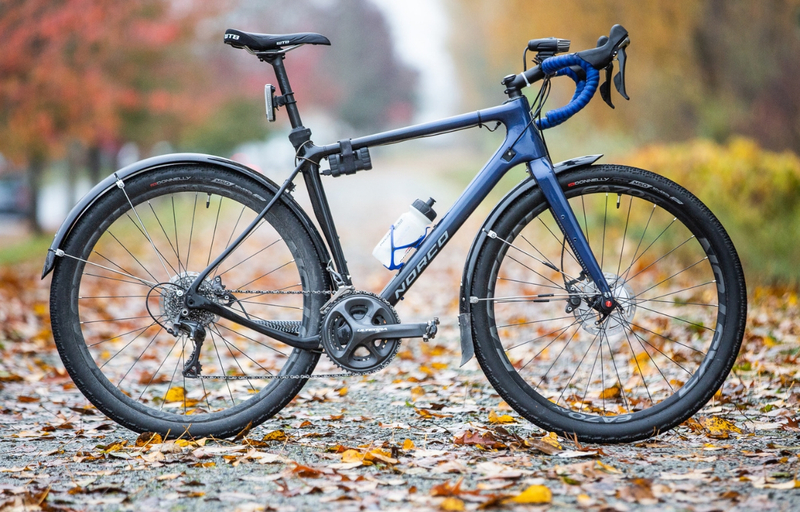 The Donnelly X’plor MSO road-plus tires of his Norco Search XR are ideal for mixed-terrain offerings, being reliably grippy and keeping steering predictable all year round. In the winter months, you won’t see Rob’s bike without at least one pair of Serfas lights attached. 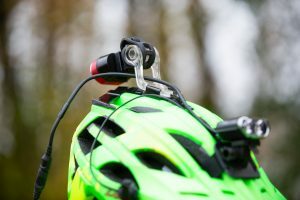 A Serfas ‘Johnny Five’ 2500 lumen bar-mounted light is bright enough that Rob never has to slow his pace, while a True 1200 on his helmet does dual duty of illuminating corners and keeping him visible. 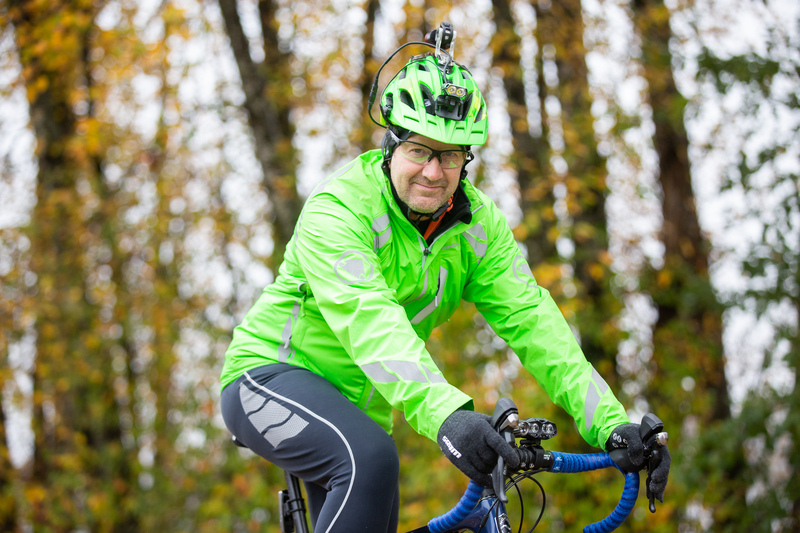 A bike-mounted True 150 rear flasher and Cosmo 60 mounted on Rob’s helmet ensures that he’s visible from multiple angles and from blocks away. You can’t call your bike winter-ready on the West Coast without a solid pair of fenders. Rob has stuck with Axiom fenders for his latest build, using a pair of Roadrunner 26’er fenders to provide adequate coverage over his 650b wheels. 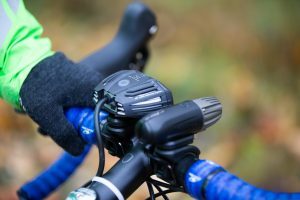 While this setup is ideal for commuter bikes, protecting the rider’s face, feet, and back from spray, it should be noted that extensions that almost reach the ground are a good idea for group rides. 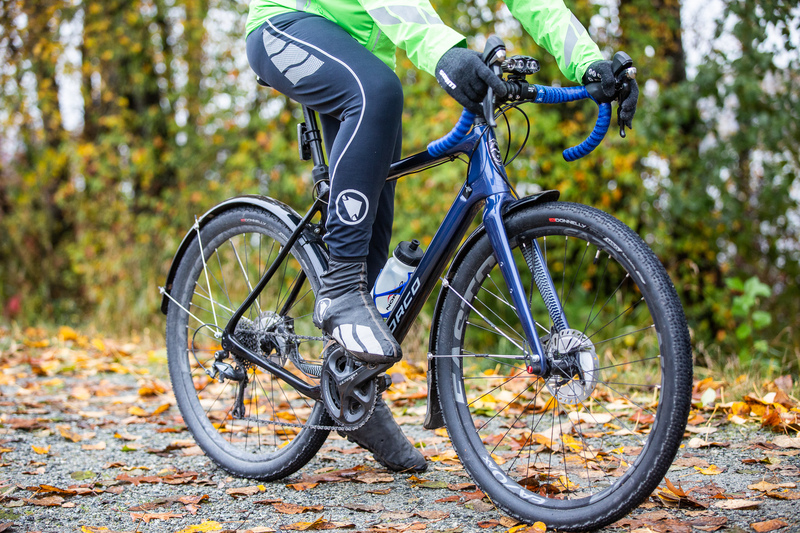 Scottish cycling clothing experts Endura make several full lines of wet-weather capable cycling gear, and if it’s tough enough to survive Scotland’s terrible winter conditions, it’s certainly good enough for Vancouver! The Luminite series is designed for commuter cyclists who refuse to let inclement weather stop them from riding, fully seam-sealed waterproof and built with reflective elements all around. A Luminite waterproof jacket keeps Rob visible and dry, while Luminite pants and Luminite II overshoes keep him comfortable even on the wettest days. If you see Rob out on the road or trail (first, congratulations on getting up that early), make sure you say hi! As always, all the customizations listed here are available through your local Live to Play Sports dealer!